We’d love your help. Let us know what’s wrong with this preview of Seeds Move! by Robin Page. Every seed, big or small, needs sunlight, water, and an uncrowded place to put down roots. But how do seeds get to the perfect place to grow? This exploration of seed dispersal covers a wide range of seeds and the creatures t Discover the fascinating and surprising ways that seeds move and find a place to grow in this gorgeous picture book from Caldecott Honoree Robin Page. To ask other readers questions about Seeds Move!, please sign up. Be the first to ask a question about Seeds Move! 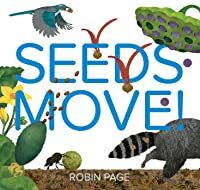 Lively verbs and striking illustrations bring to life the dynamic journey of seeds, helping readers understand the myriad ways in which seeds use their environments to spread and grow. Young readers will delight in the active way that plants spread their seeds. Lively, informative text and great illustrations. Great introduction to what plants need and the different ways seeds spread and grow! Cute illustrations, simple text with more information, great STEM book.